The subject title – Creamy Non-Cream Japanese Corn Soup seems contradicting, and indeed it is but actually it isn’t. This recipe yields creamy corn soup yet it does not use any cream. It has been a long time since I have lasted visited Japan and I especially miss their Creamy Corn Soup. Of course, I can always get the pre-packed ones or powdered type from the Japanese supermarkets. Or I can always grab a cup of corn soup from the Japanese fast-food chains- MOS Burgers. But, I never have enough with just a cup. This is not the first time I made this soup but the first time I made it for my kids. They simply adore the taste of the soup and ask for more after their first bowl. Which mummies wouldn’t love the idea that their kids gobble everything she prepared for them? I didn’t use any cream for this recipe, so it is the healthier version. The soup is sweet with intense corn taste. 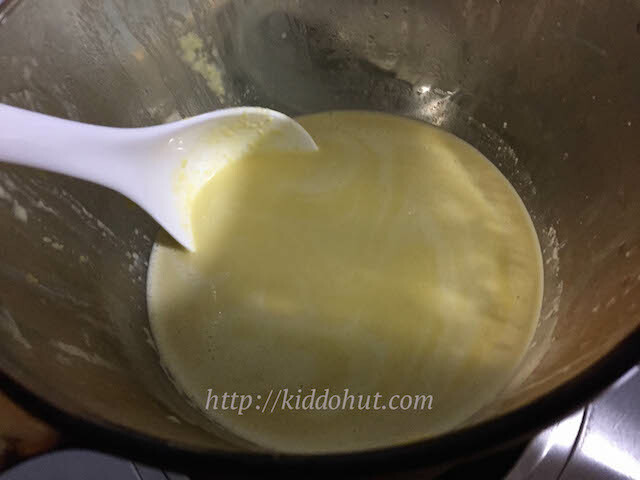 I used home-made chicken stock as soup base, in case you do not have that at home, you can either get a box of chicken soup stock from the supermarkets or make the soup stock by dissolving 2 cubes of chicken bouillon cube in the required amount of water. If you couldn’t get any Japanese corn, you can always get a bag of the frozen corn or canned type. The quantity in this recipe is for the frozen and canned types. 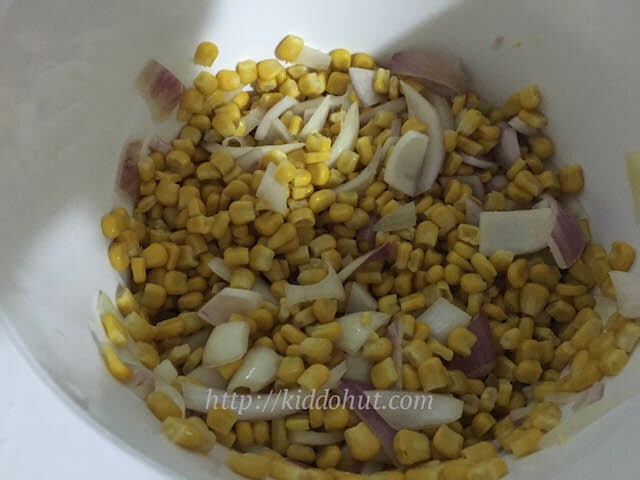 I used a lot of corn in my recipe in order to give me the creamy sweet taste especially for the frozen type, the sweetness is definitely a bit compromised compared to the fresh ones. If you are able to use the authentic Japanese corn, it will give you a sweeter taste and you can reduce the amount by 30%. If you prefer to use fresh corn, you will need to remove the kernels from the cob, which I find it troublesome to do so. 1. 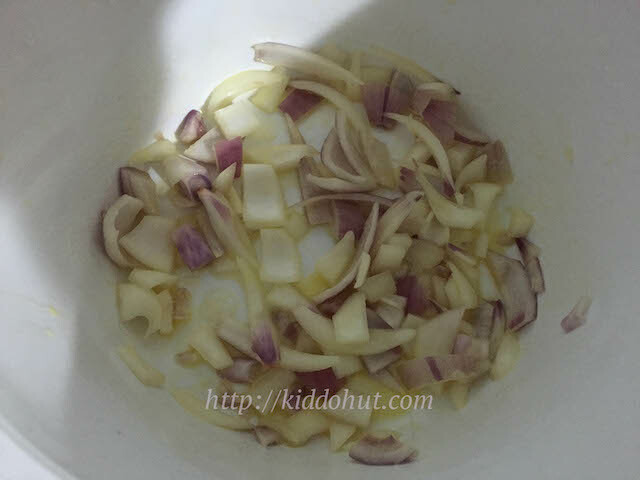 Melt the butter in the pan and stir fry the onion until fragrant and turning soft. Do not brown it. 2. Add the chicken soup and corn, and bring to boil. Simmer for 20 minutes under low heat, covered. 3. Add fresh milk and salt to taste, and stir well. Off heat. 4. Blend the corn soup using hand-held blender or food processor. 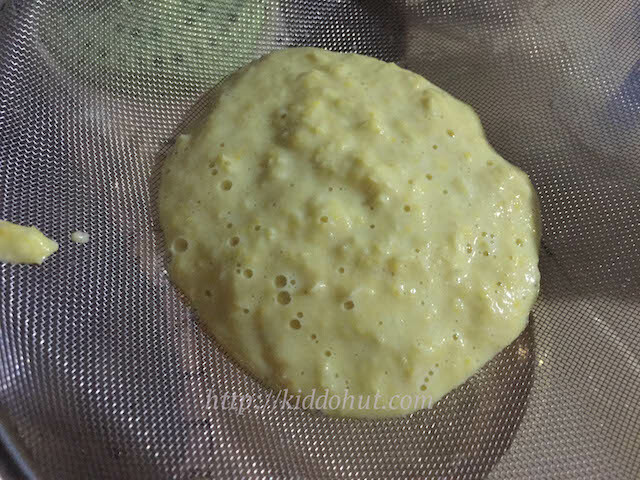 Strain the blended soup using a strainer. Press out the soup through the strainer using the back of the spoon or fork. 5. Pour the soup back to the pot and bring it to slight boil and off heat. Be careful not to burn the soup. 6. Add some pepper and bay leaves flakes (optional). Serve.